UMBC professors Kevin Sowers and Upal Ghosh have advanced a new technique to eliminate PCBs—one of the most persistent, pervasive, and dangerous chemical pollutants found in waterway sediments. Their innovative, environmentally-friendly approach, published in Environmental Science and Technology, resulted in reducing PCBs by over 50 percent in treated areas. Sowers, a professor of marine biotechnology, and Ghosh, a professor of chemical, biochemical, and environmental engineering, had been working on PCB removal separately for years. Only recently did they realize their separate efforts could be combined to create a new, more-effective way to get rid of dangerous PCBs, even in ecologically sensitive or hard-to-reach areas, such as around piers and in fragile wetlands. Sowers and Ghosh have now formed a company, Rembac Environmental, to help bring their process to more areas that need PCB remediation. PCBs were used extensively as fire retardants—and even required in some products—until they were banned in the U.S. in 1979 because of findings suggesting they might be neurotoxic, disrupt animals’ endocrine systems, and possibly cause cancer. Despite the fact that the ban has been in place for decades, PCBs still persist in sediments around the country, including in Chesapeake Bay. In the Mid-Atlantic, PCBs are the second most common reason for public advisories against consuming fish, just behind mercury. The best techniques to deal with PCBs are dredging, which physically removes the PCBs from the area (along with loads of sediment), and capping, which involves piling gravel on top of the sediment to keep the PCBs from interacting with aquatic life above. While each method has its place in the fight against PCB contamination, both are extremely costly, cannot be deployed in ecologically sensitive areas, and are not always effective. People have tried for decades to develop and sell methods to remove PCBs from sediments biologically. Microorganisms that can break down PCBs occur naturally in sediment, and most efforts have focused on encouraging their populations to grow by adding cocktails of nutrients. None of those prior efforts worked especially well, and Sowers remembers hearing repeatedly that biological removal of PCBs was impossible, but he wasn’t quite ready to give up on the idea. “The technology itself started in the 1980s,” Sowers says, when officials were trying to show that naturally-occurring microbes alone could take care of PCBs in the Hudson River. The effort was not successful, because scientists couldn’t identify the specific microbes doing the work. In the mid-1990s, Sowers and another collaborator, Hal May at the Medical University of South Carolina, identified the species, and soon after that, they developed a method for growing them in the lab without sediment. “Once we could isolate them, we could study them. We learned enough about them to scale them up and inject them back into sediment,” he says. And finally, about nine years ago, “We found that if we added them in high numbers, we could get rid of the PCBs.” Bingo. 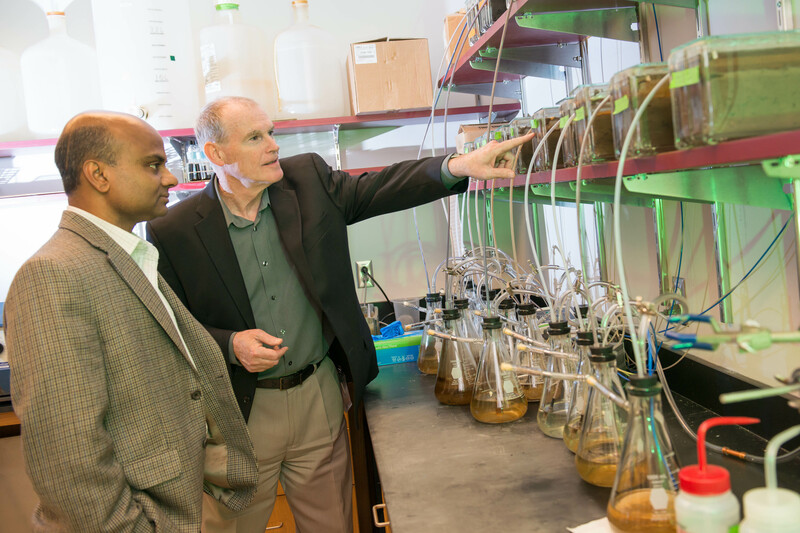 Upal Ghosh (left) and Kevin Sowers in Sowers’s lab at the Institute of Marine and Environmental Technology. Photo by Marlayna Demond ’11 for UMBC. Well, almost. Sowers was still delivering the PCB-eating microbes to sediment set up in the lab. How could he inject the microbes over huge bodies of water in the real world? Sowers’s microbes need to enter the sediment and settle there, not float around in the water. He needed a delivery method that was safe for sensitive areas, relatively quick, and ideally much less expensive than dredging or capping. In parallel with Sowers’s work, Ghosh had also been working for years on PCB remediation, but he’d taken a different approach. He had developed pellets made of activated carbon. When the pellets enter the sediment, they bond tightly to PCBs. “It doesn’t eliminate the PCBs, but it reduces the risk of PCBs getting into the food chain,” he explains. This, in turn, reduces the danger to aquatic life, and the need for fish consumption advisories. Because carbon is one of the key building blocks of all life, it also wasn’t a significant environmental threat. Ghosh founded a company called Sediment Solutions to produce the pellets, known as SediMite. But it wasn’t until Ghosh and Sowers met that they realized their projects could complement each other. “Working together allowed us to see the bottlenecks,” Ghosh says. One breakthrough for the new team was figuring out why the naturally occurring PCB-eaters weren’t enough to have a substantial impact in bodies of water. As an environmental engineer, Ghosh dived into examining the energy balance in the sediment environment, and found it just wouldn’t facilitate growth of those populations in large enough numbers. “You need the microbes in higher levels to see PCB degradation happen in months, and not decades or centuries,” he explains. With that realization, they began to see the tremendous potential of their partnership. Sowers could produce the microbes that could eliminate PCBs, and Ghosh had pellets that would settle into the sediment—a novel delivery mechanism for the microbes. “When we started working and talking together, we realized, ‘I can solve your problem and you can solve my problem,’” Ghosh says. Their new publication is the result of the first field trial of the new combined technology. Sowers and Ghosh found a way to bind the microbes to the pellets, and sprayed them into a polluted body of water on the Quantico Marine Corps Base, which drains into the Potomac River. The Department of Defense funded the trial as part of its commitment to clean up PCB contamination at military bases. The experiment was a success, showing not only that the method is effective at removing PCBs, but also that it didn’t negatively impact the local environment in any detectable way. Ghosh and Sowers also found that the plot treated with the combined microbes and pellets showed a greater reduction in PCBs than a plot treated with the carbon pellets alone. This is the first concrete evidence that a biological approach to removing PCBs can work if delivered in the right way. Ghosh and Sowers hope the technique will become popular for use in sensitive and hard-to-reach areas. For now, their company is working with another biotech firm to produce the microbes at large scale, but as they take on more remediation projects, they hope to expand their company and start growing the organisms themselves, Sowers says. Banner image: Kevin Sowers (left) and Upal Ghosh in Sowers’s lab at the Institute of Marine and Environmental Technology. Photo by Marlayna Demond ’11 for UMBC.